Would you like to make better-informed decisions about where to invest your time & resources? Are you interested in gaining more insight into what is working, what isn't, & why? There is a movement towards advanced & predictive analytics in the Learning & Talent Management space. But what does that really mean? 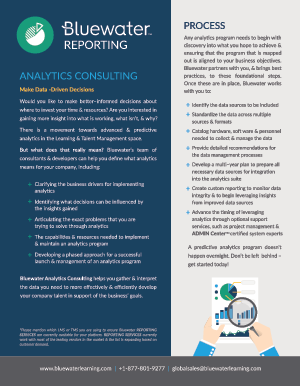 Bluewater's team of consultants & developers can help you define what analytics means for your company.